Tim Walsh and his colleagues at Mayo's Technology Drive Center in northwest Rochester are badge-carrying members of the Mayo Clinic employee family. But he says it wasn't easy to tell, given the location and decor of their building. "There's really nothing 'Mayo' inside of our building other than the employees," he says. Walsh decided to do something about that after Sister Tierney Trueman, Mayo Clinic Values Council coordinator, visited their space to give a presentation about Mayo's values. "At the end of her presentation, I asked her how a building likes ours can feel like it's so outside of the rest of Mayo Clinic?" Walsh says. As examples, Sister Tierney tells us Walsh pointed to the lack of holiday mementos and caroling seen in other parts of the campus and that during Heritage Days, he and his co-workers simply get an email telling them ice cream has been delivered to the break room, far away from the full-fledged celebration going on downtown. "That really struck me," Sister Tierney says. And she took his concerns back to Mayo's Values Review Committee, who then invited Walsh to their next meeting. During that meeting, one of the committee's members, Public Affairs Specialist (and friend of In the Loop) John Murphy, offered up a partial solution. "John said, 'We have these posters that are just sitting in storage,'" Sister Tierney says. The posters had graced the halls of the Mary Brigh building and had been used during the Emergency Room remodeling project." Calling them "posters" may be selling them a bit short, however, Sister Tierney says. "They're huge. They're like six feet tall and three feet wide. They're panels, really." And they highlight things that are huge to Mayo Clinic -- service, teamwork, trust, quality, hope … you know the list. 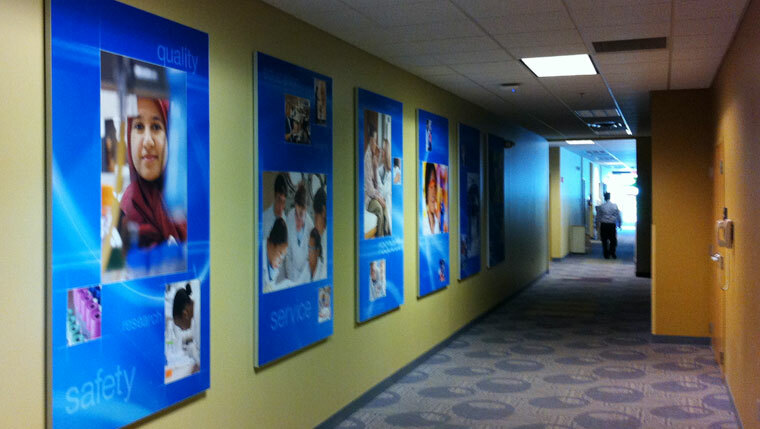 So the posters-slash-panels were brought out of storage, dusted off, and hung in two hallways at Technology Drive Center. And Walsh says the response has been as impressive as the new wall hangings themselves. "I've actually had other employees come up and thank me," he says. "It's definitely livened up the place." Walsh and his colleagues aren't stopping there, however. They've also formed a Mayo Clinic Values Committee of their own to help make sure that Mayo's values are "taught and seen" wherever Mayo Clinic employees may be. If you and your co-workers are in a similar boat, Walsh says you can send him an email to talk about ways to "help make sure those buildings outside of downtown really extend the values of Mayo Clinic as a whole." You can extend our value by sharing your comments below. While you’re here, you can also share this story with others using the handy sharing tools.